Alfonso Cuaron has spent the last few years putting together his next feature film, Gravity, and it promises to be one hell of a visual spectacle. Every frame of footage we've seen thus far has been absolutely stellar and beautiful, and from the looks of the trailers it appears that the only real way to see the movie will be on the biggest screen imaginable. Fortunately, when Gravity comes out this fall it will be getting a special run in IMAX theaters, and today we have a brand new poster, courtesy of the official IMAX Facebook page, celebrating that fact. In the movie, Sandra Bullock stars as Dr. Ryan Stone, a scientist who travels into space to help repair a broken satellite. Working alongside astronaut Matt Kowalsky (George Clooney), the mission appears to be going well - that is, until tragedy strikes. A cloud of space debris rocks the satellite that Stone and Kowalsky are working on, and the impact sends them hurtling into space. Together they try to escape the void of space and somehow get back to Earth before their oxygen supplies are completely eliminated. It's been reported that Bullock and Clooney are the only actors who show their faces in the movie, though a recent trailer seemed to reveal that Ed Harris is part of the cast as well. 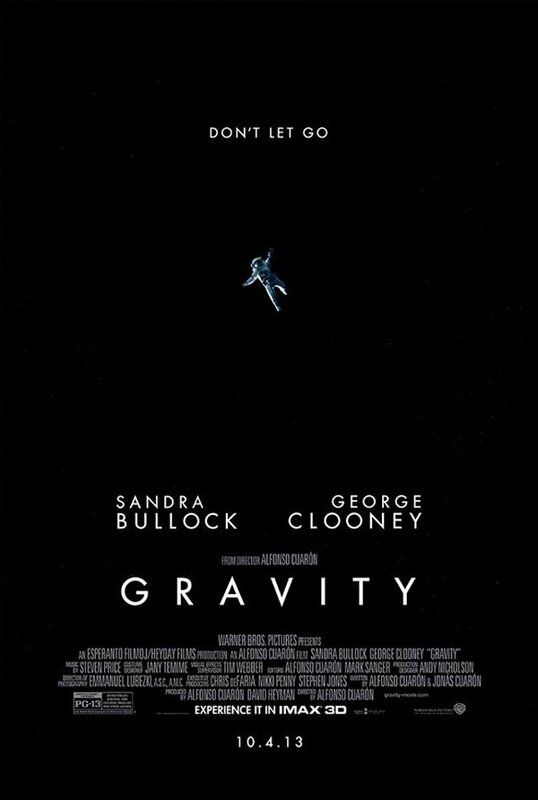 With the film set to hit the festival circuit in the next few months, with premieres set up at both the Venice Film Festival and the Toronto International Film Festival, we've been seeing quite a lot from Gravity of late, even though the film won't actually be in theaters until October. Not only do we have this fantastic new IMAX poster, we recently got to attend a panel for the movie at San Diego Comic-Con (which you can read all about HERE), and Warner Bros. released a trio of trailers that hit cinemas last week. You can watch all three of those previews below. Gravity, which is Cuaron's first feature since the absolutely brilliant Children of Men in 2006, is easily one of our most anticipated titles in the rest of 2013. See it in both 3D and IMAX when it comes to theaters on October 4th.